It's a stupendous, luscious, wildly successful atmospheric art object that wrestles with the most fundamental of questions: "What does it mean to be human?" The film is so enormous, so expansive, so auditorily thunderous and cinematically breathtaking and sweeping and large, yet equally detailed and finite and granular. The breadth and depth and width of the thing leaves one's mouth constantly agape, transfixing and hypnotizing as it advances slowly forward—blue-green scene by synthetic blue-green scene—while falling rain, ash, snow, and radioactive dust are exquisitely captured, refracting and bending glinty beams of light against each gorgeous drop and speck and flake and fleck. It's deliberate in the most rapturous ways imaginable, the camera magnifying the tiniest of moments and features, from hairs on the back of men's hands to pores on women's faces that shimmer and gleam as if translucent. Blade Runner 2049 appears equal parts digital Japanese magazine and dystopian L.A. garbage heap, beautifully slick and horrendously twisted and rusted, enormous and inaccessible while also intimate and inevitable. At nearly three hours, it's a visual confection, the stimulatory equivalent of licking snow-cone syrup from your lips or being lulled to sleep by the warmth of dusky summer sun against your skin. It is at once delectable and pleasant and peaceful, but also ominous because we know anything too good to be true probably isn't and, for all their delights, sugar and sun inevitably collect their pound of flesh. 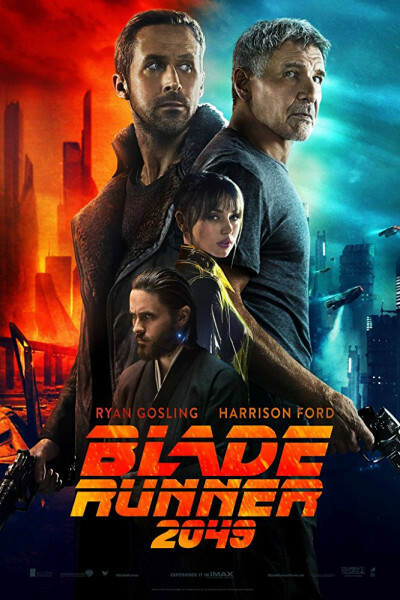 Blade Runner 2049 deserves every bit of IMDB's 8.7, but perhaps you'll agree that—like a perfect facsimile of reality—it is still missing something. Perhaps something je ne sais quoi, though I think I know exactly what it is: tonal emotion. It's a tiny amount of the ingredient that's needed here (just a dash more would do it), virtually imperceptible or invisible to the naked eye, and impossible to quantify, but needed nonetheless. I felt the heavyweight film fell just one gram short, and could have been remedied by ten seconds more. Two scenes, in particular, could have brought the house down if only the camera had lingered a single beat longer on each. Ironic, I think, that for all its tarrying, it hurries in the two moments I'd rather it pause. Regardless, when Blade Runner 2049 fades to black and everyone stands to clap, you'll hear many gasp and utter, "Wow. Just...wow...."
High praise, indeed, as rendering someone monosyllabic or altogether speechless always is. But I saw neither hide nor hair of a single tear and, to me, that's exactly what we all needed. Had earned, in fact, for this journey to the center of another world to be complete. When inspecting the perfect Louis Vuitton knockoff, one can't quite put her finger on what's amiss until she holds the leather in her hands and runs delicate fingertips across the hide and then, just like that, she knows the stunning reproduction is too perfect. It is our imperfection that makes us human, and real. Authentic. To be "more human than human"—as presented here—is to be less so, not more.